Make this easy and tasty no-cook salsa and use to garnish anything from fish tacos to salmon or eat with chips for a fresh snack. 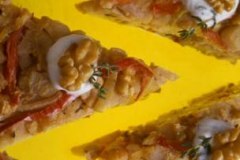 Recipe for Walnut Coated Fish Fillets with Corn Salsa. This is an awesome flavorful way to prepare your favorite fish.